Hellebore from the Whistling Gardener’s Yard. Photo courtesy of Sunnyside nursery. When it comes to perennials, the Perennial Plant Association is the place to go when you want to know what is happening in the world of these wonderful plants. One of the things that this association does is to promote certain perennials by declaring a “Perennial Plant of the Year.” These are not new introductions but rather tried and true varieties that are guaranteed to be easy to grow and disease and pest resistant. Hellebores are commonly known as Christmas Roses or Lenten Roses. They of course don’t have much to do with actual roses but the flowers do resemble a single wild rose. Many varieties bloom from Christmas to Easter and therefore are associated with this time of the year. I have multiple flavors in my garden that are in bloom as we speak. The traditional Christmas Rose is a short plant about one foot tall with mostly white flowers that nod down to the ground. All hellebore flowers last for months but lose their color after several weeks and turn green for the rest of the time. You can always cut them off at that point if you don’t like them. In 2014, a new hybrid of the Christmas Rose was introduced called “Ivory Prince” which held its flowers upright and outward so you didn’t have to stand on you head to enjoy them. Since then there have been dozens of new introductions with bigger, more colorful (pinks to deep reds) flowers and foliage patterns that are mottled or variegated which add more visual interest to our winter gardens. 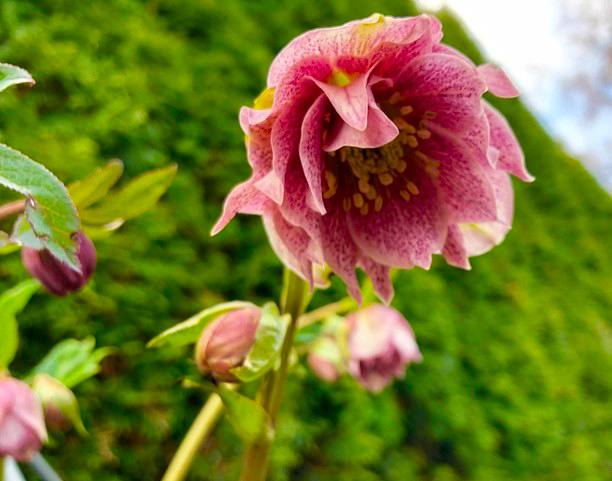 The Oriental Hellebore (also known as Lenten Rose) blooms just after the Christmas Rose and is taller (about 18 to 24 inches) and comes in a much larger range of colors. There are multiple new strains that have been introduced in the last ten years that will blow your socks off with colors ranging from yellows and apricots to dark smoky purple (almost black). Many have freckling on their petals and some are ruffled. More recently, double ones have come on the market that are to die for. The Stinking Hellebore is a very attractive evergreen perennial that blooms with apple green flowers in February and March. The fragrance isn’t anything to write home about but the foliage is wonderful. I have a golden foliaged one called “Gold Bullion” that is quite showy. The Corsican Hellebore is a still larger variety that can get up to three to four feet tall and blooms in late March, again with the greenish flowers atop the three foot stems. I have one under my birch tree that performs like clockwork every year. It is also slightly more sun and drought tolerant than the above varieties. For an exotic variation, try one of the varieties with stunning mottled cream foliage. This time of year the new growth is spectacular. Needless to say, I have one of each of these varieties growing somewhere in my garden and look forward every winter to their performances. I have never seen a slug bite, never had to divide them, never had to spray them, and often dig up seedlings that I have shared with my gardening friends. The only yearly maintenance needed is to cut off the old foliage as the new blooms or leaves emerge. Every garden needs a hellebore or two (the more the merrier in my book). Again, you can find Hellebores in full bloom now at just about any garden center. The exotic ones get snatched up fast, so don’t wait until the weather is warm and cozy or you will miss out. Whether you are a weekend “yardner” or fanatical gardener, you can’t miss with any of these Hellebores. They are truly the winter jewels of our gardens. Sunnyside will be hosting two free classes – “Roses for Everyone” on Saturday, February 9, 2019, at 10:00 am and “Bring Back the Bees” on Sunday, February 10th, at 11:00 am. More information can be found at www.sunnysidenursery.net/classes.